"One Legendary Trait – Unsinkability. It's the backbone of the Whaler legend. Indeed, Boston Whaler has gone to drastic lengths to demonstrate this essential characteristic on all its boats." The 210 Montauk, subject of this review, is brand new for 2012 and is the largest of four models in the Montauk series, starting with the 150. 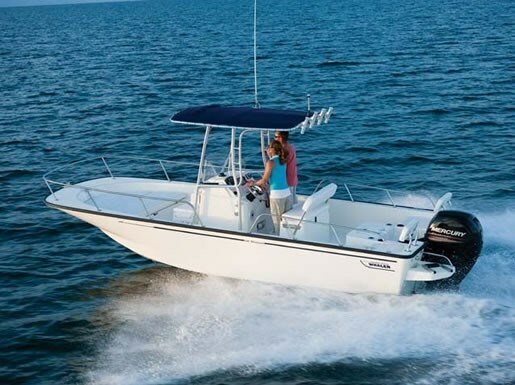 It is one of five new Boston Whaler models for 2012 and one of a total of twenty-seven models from eleven to thirty-seven and a half feet in five series. "No boat recalls the brand heritage of Boston Whaler quite like the Montauk." "The all-new 210 Montauk takes this classic platform to new levels of functionality and possibility." This new Montauk adds over two feet of length and six inches of beam over the next smallest 190 model, although the interior freeboard remains the same at 19-inches. 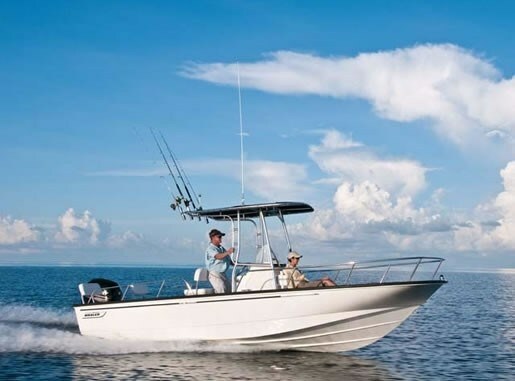 In Boston Whaler's words, "The size gains create an expansive forward deck with a large fishbox, anchor locker and a convertible cooler seat." 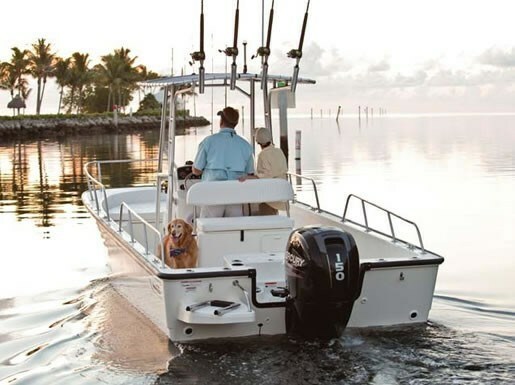 As with most Boston Whaler's, the standard equipment that comes with the base boat is quite sufficient for many purposes, however a long list of available accessories allows you to personalize your boat for exactly your intended purposes, be that fishing, cruising comfort, or watersports – or even all three. 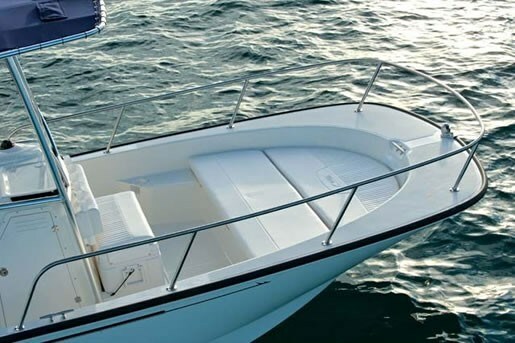 Let's examine the basic boat with standard equipment first and then deal with the range of accessories that augment the various intended purposes. Starting at the stern, on the port side is a fibreglass swim platform with grab rail and stainless steel telescoping boarding ladder. Inside at the stern are quarter seats on each side with hinged covers and storage below. At the bow are molded in boarding steps on both sides and a full width locker with fibreglass cover as well as a fishbox and storage compartment, both with overboard drain. Welded stainless steel bow and side rails are also standard. The helm features a double wide reversible seat with locking backrest and storage below. 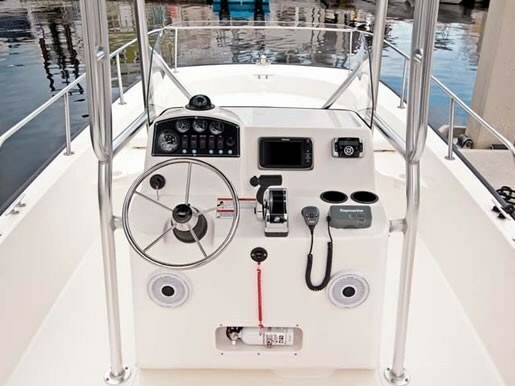 A trademark stainless steel steering wheel fronts a console with standard outboard instrumentation, binnacle motor controls, a compass, acrylic windshield and lots of room for your selection of electronics. A starboard side door in the console provides access to a huge storage compartment or the optional pump-out head. Regarding power for the 210, perhaps Boston Whaler says it best. "Its standard boat-motor-trailer package includes a 150-hp Mercury FourStroke, allowing you to go farther and stay out longer." The standard trailer is a galvanized, tandem axle with swing-tongue, tongue jack, and disc brakes. The trailer may be upgraded or optionally deleted. The standard 150 XL EFI Mercury® FourStroke would seem to be plenty of power for the 210 Montauk providing a reported top speed of 42.1 mph at 5900 RPM. The most efficient cruising speed would appear to be at about 3500 RPM giving 23.5 mph while consuming 4.6 (US) gallons per hour and a range of 308 miles. You can upgrade to the same horsepower or even a 200-hp in a Mercury Verado FourStroke, both with DTS (Digital Throttle and Shift). Hydraulic steering is standard with all. There are several seating options you may want to consider for the 210, most notably cushions and backrests for the stern quarter seats or perhaps an aft bench seat with cushion and backrest. Up front, add two-piece folding bow cushions or perhaps even a sunlounge. A double-wide 94-qt. 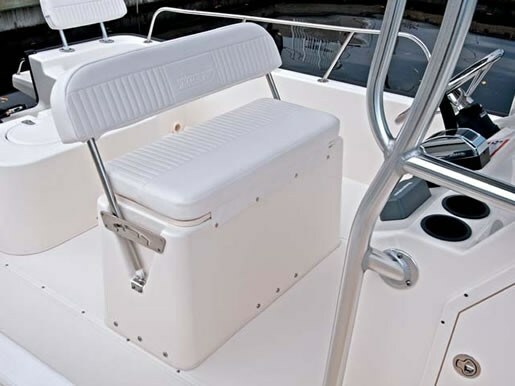 cooler with cushion and backrest sits neatly in front of the console and six rod holders may be added to this. The T-top or sun-top options both look great and are extremely practical whatever your intended boating desires. There are lots of great fishing options available including a livewell with blue interior, a pedestal fishing seat, pre-wired trolling motor panel, aft side rails with rod holders, and tackle boxes. You'll want to choose one of the Raymarine® electronics/navigation packages with either a 5.7" or 7" screen plus probably the VHF radio. The 210 Montauk certainly continues Boston Whaler's tradition and legend. It's a fun, versatile, and safe way to get out onto the water.